Come see dance pop phenomenon Grace Valerie perform new music live at the LA Tiger Heat party. The beautiful pop songstress, who will soon be releasing her new single “Magic”, will be bringing her own personal brand of foot tapping, body shaking dance music to the legendary Tiger Heat at Hollywood’s historic Club Avalon on May 21st. Initially discovered by Grammy-award winning producer and former American Idol host Randy Jackson in 2010, Grace Valerie has since been making a splash in the pop and dance music scenes. Not only have her songs been well received on the charts, even becoming a No. 1 “Most Popular” MTV video, but they also seem to resonate with lovers of all genres. Grace not only performs music that is loved by established fans of dance and electronic pop, she also continuously pushes the envelope and forces her art to evolve. It’s not enough to get fans on their feet, she also wants to give them music that is new and fresh and always ahead of its contemporaries. Keep an eye out for the release of “Magic” at the end of this month! To stay up to date, check her out on Facebook, Twitter, Youtube, and her official website www.GraceValerie.com. Chicago Soul Singer-Songwriter Sijay is that breath of fresh air in a generation that has become used to auto-tuning, and loud beats drowning out poor singers. Sijay is like no other in his class, and would duet seamlessly with talents like the Queen of Soul herself Aretha Franklin. “Detroit Club” is what soul should sound like in this day and age. 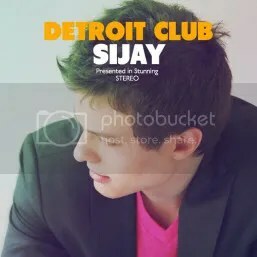 His label is giving away the full length lead single “Detroit Club” when you sign up for Sijay’s newsletter. To get your free download, Click here and hear for yourself! Between 2000 and 2009, after fronting several different bands including Lobster Newberg, recording two Studio albums and a grueling National tour, Sijay couldn’t get in the studio fast enough. Within only a month, he wrote and recorded half a dozen songs that explored genres yet to be pioneered. With influences ranging from the funk and soul of Herbie Hancock, and Stevie Wonder to the alternative rock styling of Donald Fagen, Phish and Joni Mitchell, Sijay’s album “Detroit Club’ combines these genres, and mixes some RandB and jazz. This 22-year old defies expectations of what a 22-year should sound like. Sijay projects the experience and vocals of a veteran artist. While listening to the songs off of “Detroit Club,” you forget that this is such a young man singing! He has the soulfulness that defines the Soul genre.